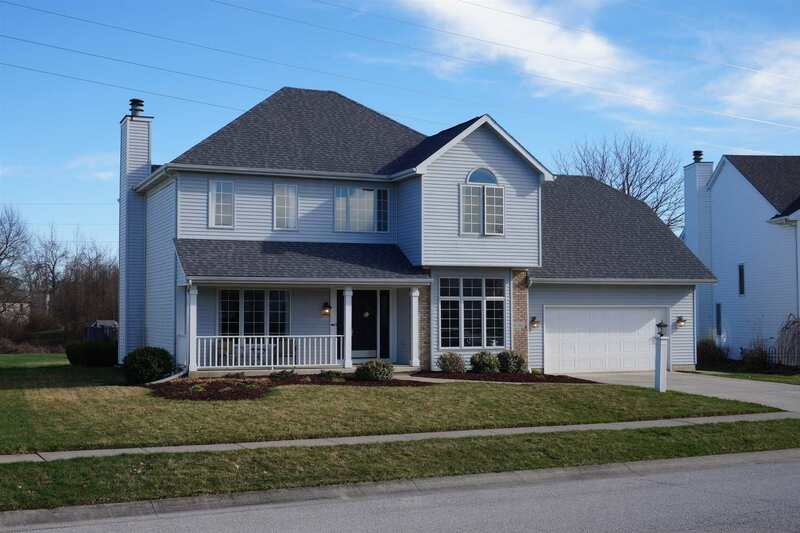 This up-scale 4 bedroom 3.5 bath home offers a beautiful grand foyer entrance, a large open kitchen with an island, formal dinning room, 9&apos; tall ceilings, laundry room, and there is convenient pocket doors that leads into the den. The family room has a gas fireplace. The kitchen is well-equipped with stainless steel appliances, stool seating at the island, and a pantry. The Laundry room has plenty of cabinets, and the entrance off the garage is spacious. On the second floor there is a lovely master suite with a glass enclosed titled shower and jet/garden tub. Bedrooms are generous size -the 4th bedroom has large walk-in closet. The hall bath has a unique set up - there are 2 shower rooms with vanities, and a separate room for the commode. No more fighting over bathroom space here!! There is a full finished basement with a recreation room, an office/ workout room, and storage space with shelving that remains. Surround sound speakers remain. The roof is less than two years old, and the water heater is 1 year old. The over sized attached 2 car garage has room for a workshop or extra storage. Close to I-69, Parkview and Dupont hospitals and is located in the Leo school system. Don&apos;t miss seeing this beautiful, move-in ready home.